You can see it, right? SpongeBob? Square-ish pants? SpongeBob SquarePants! Okay, okay, I mean, check out this yummy Chocolate-Covered Pineapple! Dipping fruit in chocolate can be a little tricky. Most fruit is pretty moist. Canned fruits are literally swimming in syrups. The problem is chocolate doesn’t mix very well with liquids. It seizes up or slides off whatever wet food item you’re trying to put it on. The solution? For fruit, all you need to do is pat it dry with a paper towel until all the sides are “dry”. If it’s been sitting in liquid, I would wrap a paper towel around the fruit sections and squeeze each piece firmly, but without damaging the fruit. The more liquid you can get out of it the better. The rest is easy; you just dip the fruit with a skewer, fork or your fingers if you’re doing a partial dipping like I did here. Temper or melt chocolate in microwave. Place chocolate in a microwave safe bowl. Nuke for 30 seconds. Stir. Repeat these steps until the chocolate is almost completely melted. Continue stirring until completely melted. 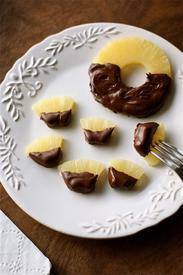 Dip each pineapple piece in chocolate and place on a lined cookie sheet or plate. Set the dipped items on wax paper and chill for 10 minutes in the ‘fridge.